Young network managers will not be able to resist this mighty hub of activity! 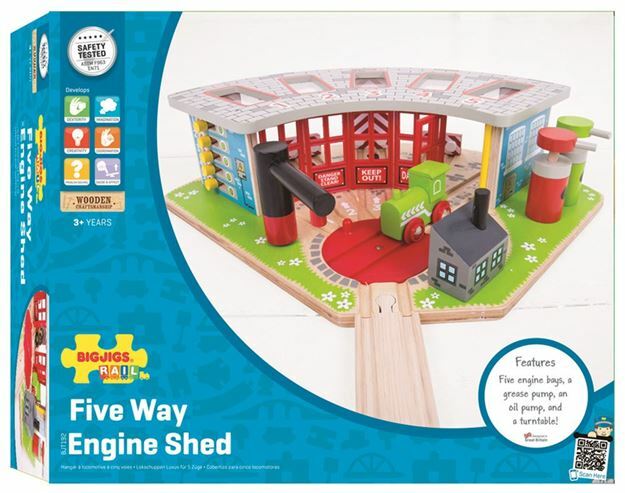 Painted in bright colours with a sturdy construction, the Bigjigs Rail Five Way Engine Shed is a great way to extend any wooden train set. Featuring a working turntable, opening doors, freestanding workmen and two pumps - along with space for up to five engines! The switchable 'in-use' and 'empty' signage panel helps to provide young minds with a sense of order and forward planning. Includes: a five-way engine shed and 2 grease pumps. Age 3+ years. Compatible with most other wooden railway brands. Distributed in New Zealand by Holdson.